Professor Paul McNamee AM (BSc 1976) is a sports administrator and former Australian tennis player. Paul played a key role in the establishment of the Hopman Cup international tennis tournament in 1988 and served as director of the cup and CEO of the Australian Open until 2006. From 2006 to 2008 Professor McNamee was tournament director of the Australian Golf Open, helping to raise the profile of national golf championships, particularly the Women’s Australian Open. He was also CEO of the Melbourne Football Club for a brief period in 2008. Paul played tennis from an early age and showed promise throughout his teens. While completing his Bachelor of Science with majors in Statistics and Law at Monash, he won a full blue for tennis. Paul was soon a champion tennis player becoming Australia’s number one ranked player in 1985. He was a renowned Davis Cup performer and a notable doubles champion with Peter McNamara, netting them the 1980 and 1982 Wimbledon crowns. 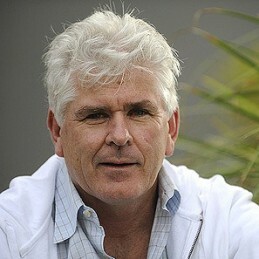 In 1986 Paul McNamee was made Member of the Order of Australia, and in 1987 was awarded with the Warren Kennedy Memorial Award for Sportsmanship. In 1996 Monash presented Professor McNamee with a Distinguished Alumni Award. Paul has recently been named a Vice-Chancellor’s Professorial Fellow. He is assisting Monash’s development as an enhanced destination for elite Australian and Asia-Pacific athletes and for sport-related study.